The tour will celebrate the world’s longest running science fiction TV series, presented by Fifth Doctor- Peter Davison, showcasing the evocative and thrilling music written by Murray Gold for the series since 2005 and featuring over 100 performers including the BBC National Orchestra of Wales and members of the BBC National Chorus of Wales. The show features a host of the Doctor’s famous adversaries including the iconic Daleks and Cybermen, the spine-chilling Silence and many more fan favourites. 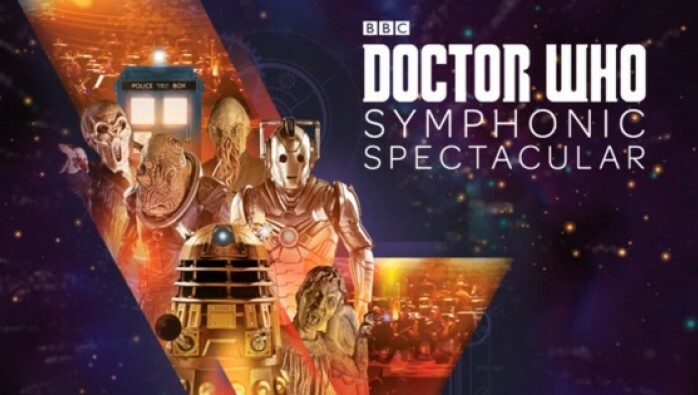 Vision Nine and BBC Worldwide are delighted to bring the UK and European premiere of the hugely popular Doctor Who Symphonic Spectacular to six major UK venues in May 2015. The live show, which was a sell-out on its world premiere in Australia, will enjoy a limited run of thirteen UK performances in London, Cardiff, Birmingham, Leeds, Newcastle and Glasgow. It features over 100 performers and is conducted by Ben Foster, who conducts and orchestrates the musical scores for the TV series. Music will be performed by the BBC National Orchestra of Wales and members of the BBC National Chorus of Wales. The show features a host of the Doctor’s famous adversaries including the iconic Daleks and Cybermen, the spine-chilling Silence and many more fan favourites. The live monsters provide a dramatic contrast to the evocative and thrilling music written by Murray Gold, who has been responsible for composing music for the series over the last eight years, including the record-breaking (and BAFTA award-winning) 50th anniversary episode Doctor Who: The Day of the Doctor. The show will also feature Murray’s latest score and footage from series 8, which is airing on BBC One until November. Fans will discover the identity of the guest presenter for the UK shows later this year. The Doctor Who Symphonic Spectacular was first presented in Melbourne, Australia in February 2012, it went on to play a further nine sell-out performances at the Sydney Opera House in December 2012 receiving praise from the Australian media and fans alike. The Herald Sun called the show “Evocative and thrilling in equal measure” whilst the Sydney Morning Herald said: “The whole experience brought unalloyed pleasure that in some cases amounted to a religious rite”. The show has continued to draw record figures in Australia and most recently thrilled over 34,000 fans across three cities in New Zealand.